Sa Llavor has recently hosted a group of students from Drumduan School in Scotland. This is the second time that a student exchange has been organised with this school, who shares with us many similarities in pedagogy as well as principles and values. The exchange was organised in a way so that our guests did not feel like simple visitors, but were able to fully participate and engage in all the different activities that are part of Sa Llavor’s school program. We started the day with rhythmic exercises and we did community work in the school garden. We united our voices singing in our choir, we danced folk tunes together and played Gamelan music. 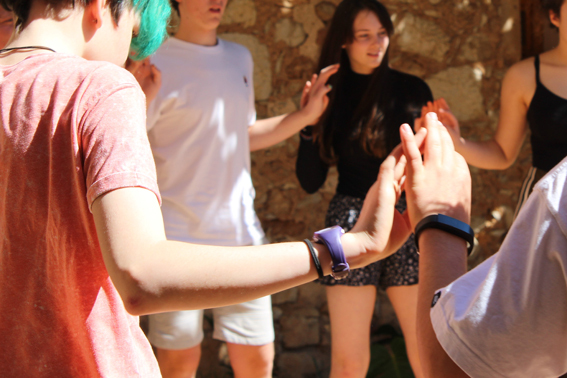 During the whole creative week the students had a rich social interaction sharing experiences and establishing new bonds. Our students are now looking forward to going to Scotland in May and having the opportunity to experience being in a different school, explore a different culture and continue cultivating new friendships.